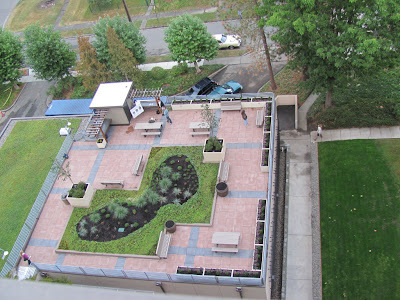 If nothing else, it's an opportunity to visit the roof of Lincoln Square high rise. Oh, what a view. The view is interesting to me since downtown Bellingham is my neighborhood. 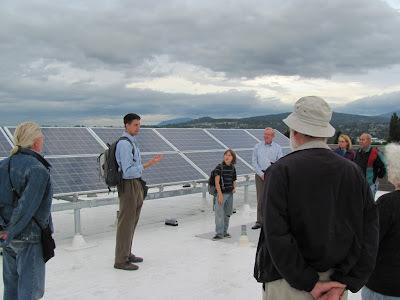 Reason for the visit was an open house to celebrate solar collectors on the roof and a green retrofit of the building. 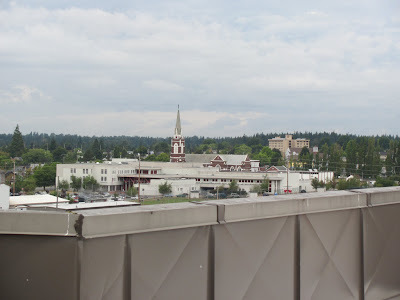 In my book, a high rise is already green compared to low density housing that spreads out over the landscape. Easier to contain impact of 190 homes when they are studio apartments and all under one roof. Stimulus money was available to make this even better. 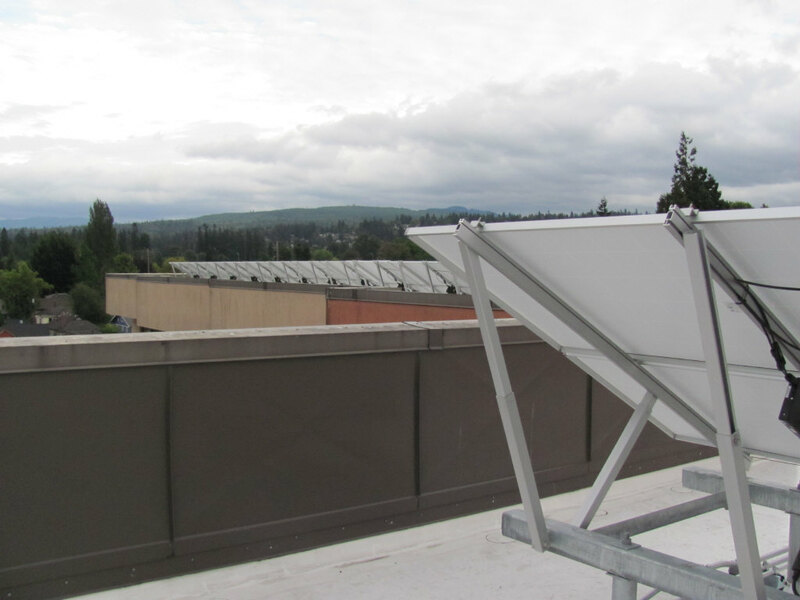 Solar collectors now provide part of the building's electricity. Up on the roof, folks discussing the collectors. See if you can spot Mayor Dan Pike in the group. 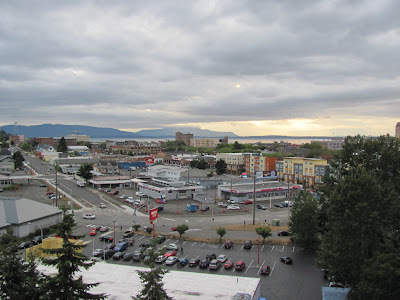 Some might ask, why bother when Bellingham is so cloudy? I learned that collectors often work better during overcast conditions. That's because diffuse light from bright clouds shines into collectors better than blue sky. Only when pointed right at the sun do collectors work best on a sunny day. Since the sun tracks across the sky, collectors spend most of their time looking at the blue sky; that is unless one has the type that rotate to follow the sun. For fixed collectors that don't move to follow the sun, bright clouds can scatter the light better than just looking at blue sky. Of course in Bellingham, the clouds are often dark, but that's another story. Looking across town, Washington Square has collectors also. 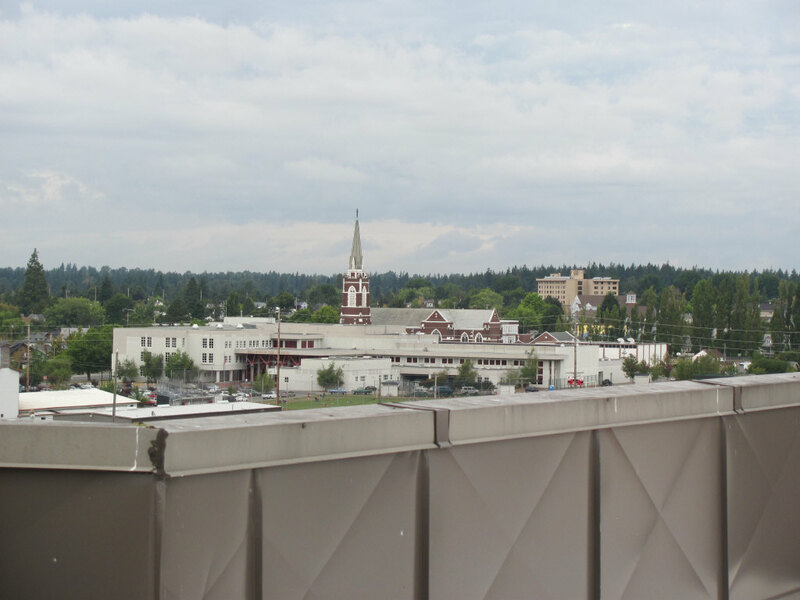 One also sees Bellingham High School, Assumption Church and a bunch of other buildings. 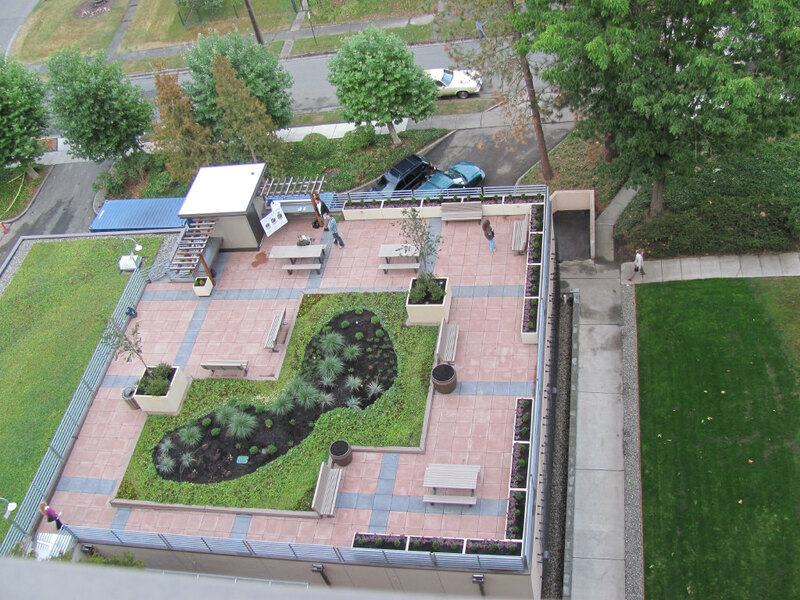 Looking down to a green roof on top of a utility building. That's where the tour began. Quite a bit was done besides just the solar collectors. Upgrades to air systems in the building can reduce stuffiness, but tenants have to be part of the solution as well. The place is now smoke free. Some might feel "big Brother" is taking over, but a smoke free environment is a big step toward a clean environment. One acquaintance of mine, who lives in BHA property, was anticipating the no smoking rule with both hope and trepidation. He hopes he can stop smoking, but fears he can't. 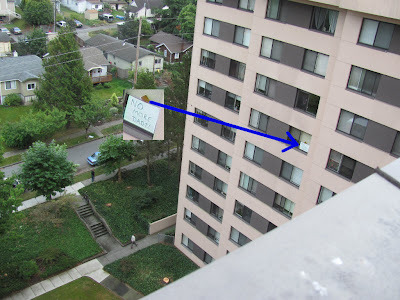 That sign in one tenant's window does say, "No More DADT." Remembering to celebrate the repeal of Don't Ask Don't Tell, September 20 2011. Official day the military dropped that discriminatory policy. Another part of the retrofit called for replacing 400 toilets. Several BHA buildings swapped out their old toilets with low flow toilets. I sometimes wonder if the low water flow toilets are really that much better, but that could be a whole topic in itself. What does one do with 400 old toilets besides adding to the landfill? 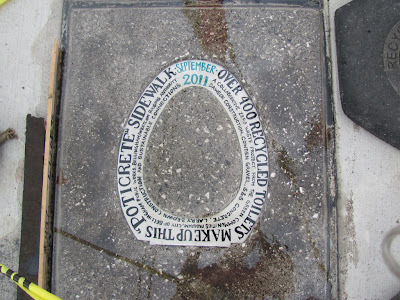 Build a sidewalk. That's what they did. 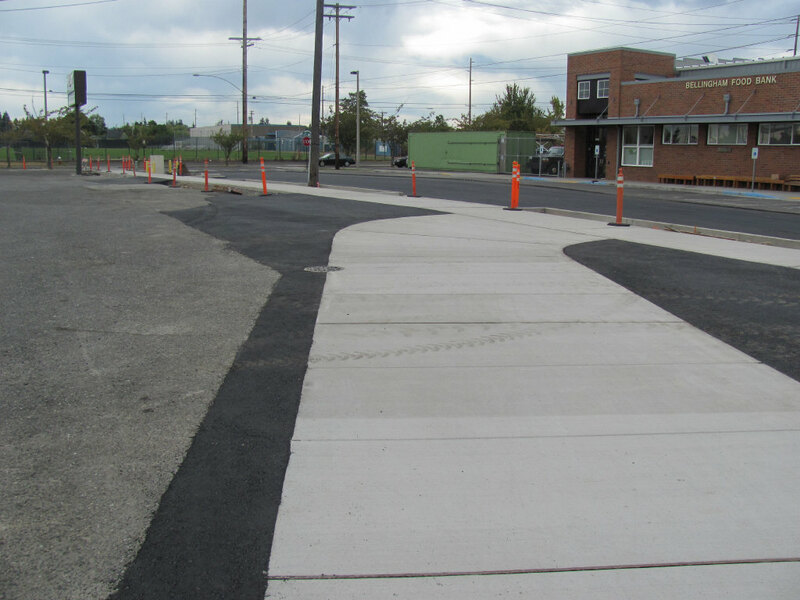 New sidewalk is between Whatcom Creek and Ohio Streets. 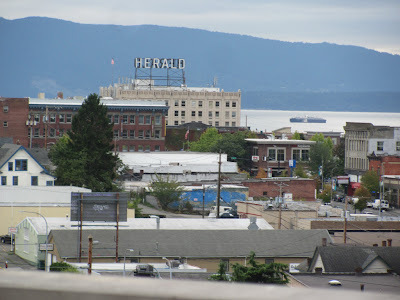 Also serves as part of Bellingham's bike path system. Aggregate for concrete was made from 400 crushed toilets. Looks like just about any other concrete.